CHICAGO — It may surprise some to find out there are hundreds of reported attempts to ban books every year in the United States. It may be even more astounding for them to hear that since 1990, the American Library Association’s (ALA) Office for Intellectual Freedom (OIF) has received reports of more than 18,000 attempts to remove materials in schools and libraries for content deemed by some as inappropriate, controversial or even dangerous. 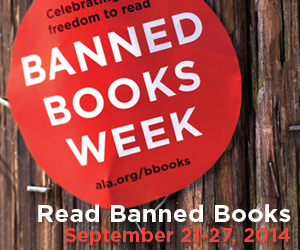 Banned Books Week, Sept. 21 – 27, 2014, reminds Americans about the importance of preventing censorship and ensuring everyone’s freedom to read any book they choose. According to ALA’s OIF, for every banned book reported, there are many more that are not. This year’s Banned Books Week is spotlighting graphic novels because, despite their literary merit and popularity as a format, they are often subject to censorship. Graphic novels continually show up on the ALA’s Office for Intellectual Freedom’s Top 10 List of Most Frequently Challenged Books. The most current list for 2013 includes two graphic novels: Dav Pilkey’s “Captain Underpants” series at the top spot and Jeff Smith’s series “Bone” at #10. Banned Books Week has been celebrating the freedom to read for 32 years. Libraries, schools and bookstores across the country will commemorate Banned Books Week by hosting special events and exhibits on the power of words and the harms of censorship. On Sept. 24, SAGE and ALA’s OIF will present a free webinar discussing efforts to un-ban books by visiting activists and speakers in London, Charleston, S.C., Houston and California. For the fourth year the public is invited to read from their favorite banned books by participating in the popular Banned Books Week Virtual Read-Out on YouTube. Past participants have included highly acclaimed and/or frequently challenged authors such as Judy Blume, Chris Crutcher, Whoopi Goldberg, Lauren Myracle and many more. This year’s new videos will feature Ana Castillo, Stan Lee and Lois Lowry, among others. In addition to book challenges, online resources, including legitimate educational websites and academically useful social networking tools, are being overly blocked and filtered in school libraries. To help raise awareness, the American Association of School Libraries (AASL), a division of the ALA, has designated one day during Banned Books Week as Banned Websites Awareness Day, Wednesday, Sept. 24. During Banned Websites Awareness Day, the AASL is asking school librarians and other educators to promote an awareness of how excessive filtering affects student achievement. “Captain Underpants” (series), by Dav Pilkey. “Fifty Shades of Grey,” by E. L. James. “Looking for Alaska,” by John Green. Banned Books Week is sponsored by the American Booksellers Association, American Booksellers Foundation for Free Expression, American Library Association, American Society of Journalists and Authors, Association of American Publishers; Comic Book Legal Defense Fund, Freedom to Read Foundation, National Association of College Stores, National Coalition Against Censorship, National Council of Teachers of English, PEN American Center, People For the American Way and Project Censored. It is endorsed by the Center for the Book in the Library of Congress. For more information on Banned Books Week, book challenges and censorship, please visit the ALA Office for Intellectual Freedom’s Banned Books website or bannedbooksweek.org.